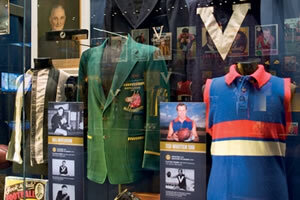 Australia's largest sporting collection is housed in the National Sports Museum at the MCG. The Australia's Game gallery hosts a wealth of material collected from the greats of this uniquely Australian game. View the most comprehensive collection ever assembled, as well as immersing yourself in the Australian Football Hall of Fame gallery, where you can pay homage to the game's greats. The Australian Football Hall of Fame was established to recognise and enshrine those who have made a significant contribution to the game. An outstanding array of material from the AFHOF legends and inductees are displayed. Examples include the guernsey worn by Darrel Baldock on the day he captained St Kilda to its 1966 premiership, a certificate presented to Hayden Bunton Snr in 1931 recognising the first of his three Brownlow medals, John Coleman's Essendon training bag and guernseys worn by Ron Barassi, Kevin Barlett, Leigh Matthews and Ted Whitten. Enter via Gate 3 of the MCG (northern side of MCG).